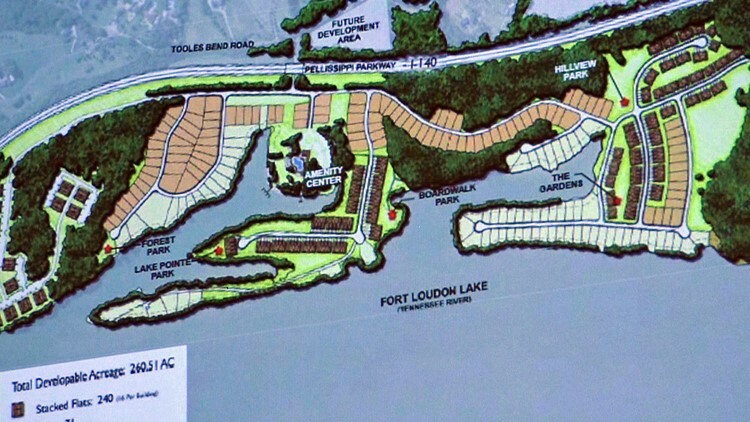 Despite strong opposition from neighbors, the Metropolitan Planning Commission approved the concept plan for a 622 unit lakefront development in Southwest Knox County. 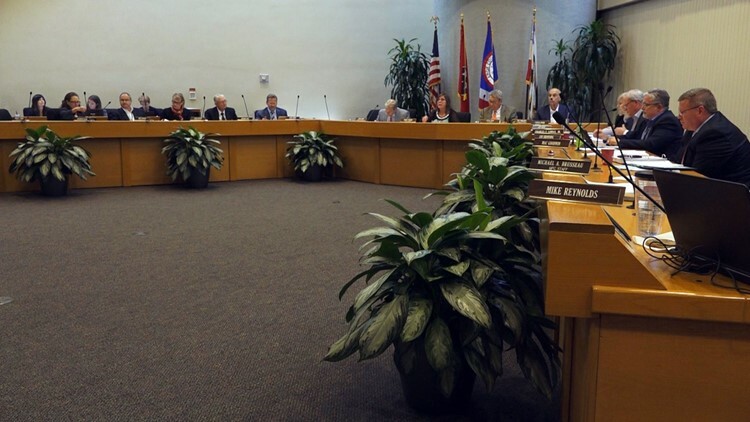 Knoxville — Thursday the Metropolitan Planning Commission approved the "Post Oak Bend" concept plan to develop more than 400 acres of lakefront property near the bridge where the Pellissippi Parkway crosses the Tennessee River. The MPC decision came with strong opposition from neighbors along Tooles Bend Road and the Northshore Drive corridor. 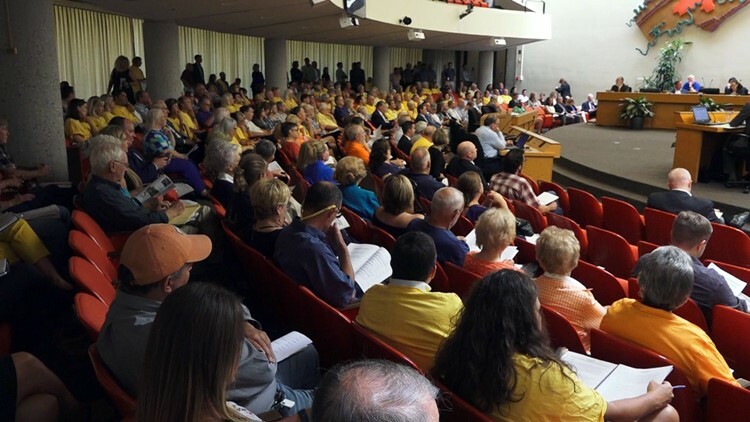 More than 100 people opposing the plan attended the MPC meeting wearing bright yellow shirts. A large crowd at the MPC meeting included people wearing yellow shirts in opposition to the proposed development in Southwest Knox County. Opponents had expressed concerns about traffic and safety on the narrow and curvy Tooles Bend Road. They expressed dissatisfaction with the level of the county's traffic study, which they felt should look more closely at the impact on surrounding routes such as Northshore Drive. "One of my favorite instructions from a judge to a jury is to not leave your common sense at the door when you deliberate the rules. This is a plan that proposes to put 622 dwelling units at the end of a winding, narrow, shoulder-less, hilly, inadequate road," said Tom Hale, attorney and spokesperson for the Northshore Corridor Association. Concept drawing for lakefront Post Oak Bend development in Southwest Knox County. The MPC said the developer had done an excellent job with the plan and agreed to several conditions to improve safety, such as realigning Tooles Bend Road, adding guard rails, and installing traffic signals at Northshore Drive. "I know change is not easy. That is a beautiful area. I don't think we can approve anything that's not first-class and top-notch on that peninsula. And what makes it really difficult is, this is that [first-class and top-notch]. It's hard to say no to something that is a great idea," said MPC commissioner Art Clancy. Clancy said the plan was well-prepared, extremely thought-out, and included details on everything the MPC normally has to demand developers provide. Metropolitan Planning Commission meeting, Sep. 13, 2018. "Most people would tell you this development is a good development," said Clancy. "This plan addressed the slope and hillside and all the things we ask about. We want internal sidewalks. Can you do nature conservancy? What about parks? What about open spaces? What about amenities? And if you go down the list, all the things we ask developers to do, this development hits all of them." The MPC approved the concept and included several conditions to address various concerns raised by neighbors. The MPC also approved variances to improve Tooles Bend Road. The developer and the MPC commission members noted none of this would happen overnight, with the development expected to take around 10 years to complete. Proposed area for the Post Oak Bend development beside the Pellissippi Parkway.